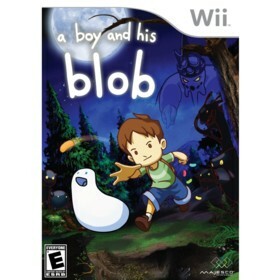 A Boy and His Blob is a Wii game in the Platformer genre. The game was published by Majesco Games and developed by WayForward Technologies. The game has an ESRB Rating of E (Everyone 6+) and was released on 2009-10-13. The game's official site can be found at www.aboyandhisblob.com. This game is based on the 1989 game for the original Nintendo Entertainment System titled "A Boy and His Blob: Trouble on Blobolonia". The developers have made the Wii version of the game much easier than its NES counterpart, which makes sense since the Wii is targeted for a more casual audience. The game is about a "blob" that comes to Earth to get help to save his planet, Blobolonia. Blobolonia is under attack by an evil force. The "boy" finds the "blob" and they work together to defeat the evil emperor. The blob obtains new powers whenever the boy feeds him different colored jellybeans (such as becoming a parachute, a ladder, a trampoline, etc.). The graphics in the game are simply amazing. The sound, while good, sometimes made me feel like falling asleep since it was so soothing (which isn't a good thing for a platforming game). Luckily, part of making the game more "accessible" was the inclusion of unlimited lives, so falling asleep while playing, then dying because of it, is not a problem :). For those looking for more of a challenge, each level contains optional collectibles which require greater use of the blob's abilities. Going for these collectibles easily extends the game by at least 10 hours (it took me about 10 hours to complete my initial playthrough where I only collected about half of the optional collectibles). Overall, this is a very fun game for the Wii that you should check out even if you haven't played the game upon which it is based.